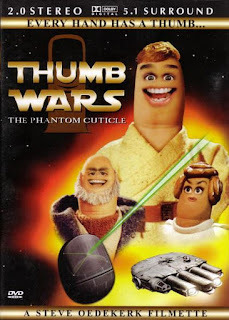 I'm not really a Star Wars fan, but this thumbellion parody is so hilarious, I've seen it again and again. It's just what it sounds like: Star Wars with thumbs. While Star Wars parodies have become so common they're basically dominating youtube, this is the one that gets everything right. Written and directed by the great Steve Oedekerk (who also brought you Kung Pow) the jokes are so tightly wound, it'll take multiple viewings just to get half of them. After watching this, you'll be ecstatic to know there's five more thumb parodies out there. Sadly, mr. Oedekerk has nothing but producer credits on the others, and except for Batthumb which is mildly amusing, the rest are best avoided. I own the complete Thumb film collection. Great post!!! Steve Oedekerk is an unsung hero of comedy. Getting his big start writing for In Living Color where he and Jim Carrey decided to go off and make Ace Ventura: When Nature calls and going on to write the screenplay for the phenomenal Patch Adams. He deserves much more recognition. Have you seen High Strung? I just got ahold of it, and am looking forward to check it out.